Many scientists used to think that heat was the product of a material called phlogiston. It flowed into objects to make them hot and out to make them cold. But when they tested for this material, they could find nothing — objects weighed the same both hot and cold. Defenders of the theory insisted that phlogiston must be made of a material that, unlike all others, had no mass. Finding that heat is actually a result of the movement of molecules, phlogiston defenders suggested that making molecules move is just how phlogiston makes objects hotter. But they were only making ad hoc excuses to save their theory; there was no need to introduce phlogiston — it didn’t explain anything. Heat could be accounted for solely by the movement of molecules and atoms; no extra substance was needed. All the work that phlogiston was supposed to have done was now accounted for by other means. Of course, one can never disprove the existence of phlogiston — one can always make excuses. But, as we know, that is not a good reason to accept a theory. It fell out of favor, and those who held onto it were behaving unscientifically. Some religious thinkers, aware of such evidence, continued to believe by changing their theory — “making neurons fire is just how the soul interacts with the body.”  But the firing of neurons can be accounted for wholly by natural physical processes. There is no reason to introduce the soul into any theory — it doesn’t explain anything. The existence of all mental activity is accounted for by brain activity . All the work that was supposed to have been done by the soul is now accounted for by other means. Of course, one can never disprove the existence of the soul — one can always make excuses. But, as we know, that is not a good reason to accept such a notion. It fell out of favor in the scientific world, and those who hold onto it are being just as unscientific as those that still believe in phlogiston. Christianity’s continued belief in the soul is wholly unscientific. Some people believe that super-intelligent aliens are secretly controlling every aspect of the world. David Icke has written multiple books on the topic . He professes evidence and knowledge of their existence, and knowledge of what they are like — they are lizards. Of course, they don’t want us to know they exist — so they hide themselves (by making themselves look human). But they are running the world nonetheless. Skeptics point out that it doesn’t seem that the world is run by super-intelligent aliens. If they are striving for peace and equality, they are not doing a bang up job. If they are trying to bring us down, they are not doing a very good job either — we advance significantly all the time. But, of course, despite the fact that he’s written multiple books on the subject of what the aliens are like and what they want, Icke claims we cannot fully understand the reasoning and rationale of our alien overlords. They are beyond us! Who knows what they want the world to look like, or what their ultimate goals are. So the fact that it seems to us that the world is not run by aliens is no reason to think it is not. A world run by lizard aliens is, Icke argues, indistinguishable from one run by humans, so he is justified in believing that it is run by lizard aliens. Of course, such thinking is wholly unscientific. For one, like all conspiracy theories, it is untestable. Aliens run the world to make it look like it is run by humans, so if the theory is true, the world would look exactly like it would if the theory was false (i.e., if the world was run by humans). And anything that did seem to be evidence against the theory would just be touted as evidence planted by the aliens to throw us off track, and thus claimed as evidence for the theory. As such, the theory is unfalsifiable; it’s not merely that one can always make ad-hoc excuses to save the theory (which one can do with any theory); the ad-hoc excuses are built into the theory before you can even go out and look for evidence. The theory makes evidence irrelevant. It is thus unscientific. In addition, it is not the preferable theory because it is not simple; it interjects far more entities than necessary for explanatory purposes — secret aliens, plots, and powers. In fact, it is more complicated than the thing it aims to explain: the organization of world powers. In addition, the alien theory does not increase our understanding — how they are pulling this off is left unexplained. The purely human theory, however, leaves nothing unexplained, is simpler, and is falsifiable. Christians believe that the world is designed and run by God, and that God is perfectly loving and powerful. Theists like Thomas Aquinas have written tomes arguing for the existence of God that also describe what God is like. Of course, God doesn’t want us to know for sure that he exists — so he hides himself . But he designed and runs the world, nevertheless. Atheists, however, point to evil in the world  as good evidence that God did not design, and is not running, the universe; this is not the kind of universe a perfectly loving and powerful being would create. The religious retort is familiar and simple. “Despite the fact that we have written tomes that describe what God is like, God is completely incomprehensible. One cannot understand his motivations or reasons, or know what he really wants the world to look like. God is beyond us.”  So the fact that it doesn’t look like God designed and runs the world is no reason to think that he doesn’t. A world run and designed by no one is, theists argue, indistinguishable from one that is run and designed by God. So Thomas Aquinas and theists like him think they are justified in believing that it is run and designed by God. Such thinking is unscientific. For one, like conspiracy theories, it is untestable. Since God hides himself and runs the world in a way that is indistinguishable from one that is run by no one, no observation could ever be made to confirm the theory. In fact, nothing — including the most horrendous evil (like the entire world being destroyed) — could not be explained away by God’s incomprehensibility. As such, the theory is unfalsifiable in the same way conspiracy theories are. It has its ad-hoc excuses built into it. The theory makes evidence irrelevant and is thus unscientific. In addition, it is not the preferable theory because it is not simple; it interjects more entities than is necessary for explanation. In fact, it might be said to be the most non-simple of theories; the entity it interjects is infinite in all respects and thus demands more explanation that anything else; contrarily, what it seeks to explain — the singularity from which the universe began  — seems to be (if anything is) something that requires no explanation (it is something that literally exists nowhere, in no space, for no time) . Lastly, the God theory does not increase our understanding — how did God create the universe, how do his powers work, why does he exist? All of this is left unexplained. Since the natural theory is simpler, testable, and answers more questions than it raises, it is the scientifically preferable theory. Belief in God, especially given the way theists defend such belief from the problem of evil, is unscientific. In India, there was a man named Sathya Sai Baba, who claimed to be a man-god, the reincarnation of Sai Baba of Shirdi (who himself claimed to be an incarnation of Shiva). To reinforce his man-god status, he repeatedly performed “miracles” in front of giant crowds of people. The complete list is far too long to mention here, but included healings, making objects appear from nowhere, miracles of “omnipresence,”  turning water into petrol, and raising people from the dead . Eyewitnesses to his miracles abound, are still living today, and proudly pronounce they believe as a result. Both he and his followers have written about his miracles and teaching and do charity work. Although it is difficult to get an exact count on his followers, they number in the millions. Of course, even if one is unable to see his miracles, or travel to India in person, one can still come to a scientific conclusion about the legitimacy of his miracles and his claims. To do so, we must consider multiple hypotheses that account for the known evidence — the reports about his miracles — and accept the most adequate one. One hypothesis is that he does what, and is who, he claims: a man-god performing supernatural miracles. Another hypothesis is that he is a fraud. He uses illusions and sleight of hand to pull off his miracles and depends on the reliable gullibility of people to not see through them. He takes advantage of people’s ignorance to convince them of his divine status. An uneducated Indian could easily mistake an illness for death and believe the ill person resurrected after Baba touched them when in fact the ill person was already going to make a natural recovery . To boot, the stories could simply be made up — either exaggerated accounts of non-miraculous occurrences, or fabrications out of whole cloth. Which hypothesis is most adequate? The fraud hypothesis is clearly simpler — it involves no supernatural powers or god-like attributes. In addition, it is conservative (it coheres with what we already know) and increases our understanding while answering more questions than it raises. If he is divine, we have no idea how his powers work; but we do know how magic tricks work, and with very little research can discover how they are done. We also know that people often believe, and even see, what they want to believe — so it is not surprising that, even if the tricks are badly done, people still believe. Even if you were to go on youtube and find videos of Sathya Sai Baba performing his miracles, and you couldn’t explain how he did them,you would still not be able to scientifically conclude that he is a god-man.The fact that you can’t figure out how a magician does his tricks is not good evidence to think he really uses magic; your inability to prove something false is not a good reason to think it is true. So too, your inability to explain how Sathya Sai Baba does a “miracle” is no reason to think it is miraculous. We also know that doctors and hospitals to confirm a death are not abundant in India, and so thinking a sick relative is dead, when they are not, is common. Our ability to confirm death is a recent and western development. We know that stories about charismatic people, and unusual occurrences, are most often exaggerated and, in their final form, do not actually represent what happened during the original event. The scientific conclusion is obviously that he is not a god-man. Yet change the name from “Sai Baba,” to “Jesus,” and Christians will come to the exact opposite conclusion. The miracles that Jesus performed, if not identical to those of Sathya Sai Baba, are those that have been performed by magicians for countless centuries. In fact, the evidence for Jesus’ miracles and divine status is even weaker than the evidence for Sathya Sai Baba’s. We have living eyewitness and videos of Sathya Sai Baba’s miracles; we only have third hand accounts, written by non-eye-witnesses, thirty years after the fact that have been unreliably copied for 2000 years, for Jesus. First century Palestine had no hospitals, and even less education and more ignorance than modern India. First century Palestinians were thus much more likely to mistake illness for death, spread false and exaggerated stories (and believe them), and be susceptible to the biases of expectation and wishful thinking thus seeing what they wished to believe. The number of followers Sathya Sai Baba had during his lifetime is even greater; Jesus’ biggest crowd was 5000, Sathya Sai Baba’s is in the millions. In fact, if I’m not mistaken, Sathya Sai Baba has more followers than even lived in first century Palestine. Obviously, there are at least two hypotheses to consider here — that Jesus was a god-man, and that Jesus was a charismatic man about whom stories were exaggerated. Clearly, the latter is the most scientific. In the same ways as before, it is simpler, more conservative, and answers more questions than it raises. Christian belief in the miracles, and divine status, of Jesus is wholly unscientific. In the first chapter of his new book, How Jesus Became God, Bart Ehrman points out that Jesus was only one among many who, during his time, were thought to be god and to have performed many miracles (such as raising and being raised from the dead). The Pythagorean philosopher Apollonius is mentioned specifically as an example of such a person who predated Jesus. Interestingly, early Church apologists didn’t deny that persons like Apollonius had performed miracles; instead, they claimed that their powers had a demonic origin, instead of a godly one. This is not surprising, given the unscientific world they lived in. Of course today we live in a scientific world, and Christians today are likely to say the same thing about Apollonius as they do about Sathya Sai Baba: the stories concerning their miracles are false. And that is the scientific conclusion. What they fail to realize however, is to be consistent (and scientific) one must draw the same conclusion about the stories of Jesus’ miracles. Summa Theologiae Part I, Question 75, article 2. Although, it should be noted, Augustine did not define the soul in the Platonic way I did above. Regardless, as we shall see, the defense he offers of the soul’s existence is faulty. For the latest such defenses of the soul, see Mark C. Baker and Stewart Goetz (eds. ), Soul Hypothesis: Investigations into the Existence of the Soul. The Continuum International Publishing Group Inc., 2010. Of course, one can still believe in consciousness — that is, mental activity. Many philosophers would suggest that existence of our own mental activity is the one thing that we can be certain exists. But what one cannot do, without being wholly unscientific, is believe that consciousness is a non-material substance separable from the body. Mental activity is produced by, and is dependent upon, the brain. See for example, The Biggest Secret, by David Icke Books, 2nd edition, 1999. This is an actual Christian doctrine: the doctrine of divine hiddenness. Christians often argue that if God reveled himself fully, then he would eliminate our free will. Natural evil specifically, which is in no way brought about by humans but is an inevitable result of the laws bequeathed upon the universe itself, poses a very serious problem for theists. There is, in fact, an entire movement of theists in the Philosophy of Religion that endorse this reasoning — they are called “skeptical theists.” See, for example, Stephen Wykstra “The Humean Obstacle to Evidential Arguments from Suffering: One Avoiding the Evils of ‘Appearance’” (p. 152) in The Problem of Evil, edited by Marilyn McCord Adams and Robert Merrihew Adams, Oxford University Press, 1990. The religious I have in mind do not deny what science tells about the age and origin of the universe — that it exploded from singularity about 13 billion years ago. They just think that the singularity, and the resulting matter and laws, were crated and designed by God. See “Simplicity and Why the Universe Exists,” by Quentin Smith, Philosophy 71:125-32, 1997. He catches people in lies. They say they are doing one thing, but Baba knows they are doing another. Here is more on Baba. Given the number of sick people Baba touched, this would have happened often; of course, all the times Baba touched someone but they did not rise from the dead would be forgotten. I again agree with much of the substance of this post, but I think there are some points that are not articulated particularly well and come across as special pleading. My understanding is that this is not true. Hot objects have more energy so they should weigh ever so slightly more. This is so slight a difference as to be undetectable, yet it must be there. Since this difference was beyond the capability of those scientists to detect, defenders of phlogiston are in some small way vindicated to my mind – this difference could have corresponded to phlogiston being nearly, but not quite, weightless, and so not quite unlike all other substance after all. While I am like the author convinced that it is true that this is all accomplished by activity in the brain, I don’t think this is sufficiently well established to call it a slam dunk. Consciousness in particular seems to elude a satisfactory explanation. There are enough holes in our understanding for a “soul of the gaps” to persist. I really don’t think that just because something is infinite it demands more explanation. Space may be infinite in extent. Would this require more explanation than a finite space? It seems to me that a finite space needs more explanation: why does it have this particular size, what is the nature of it’s finitude, i.e. does it have a boundary or does it wrap back on itself in some way and how? Likewise I find quite weak the argument that the singularity requires little explanation because it occupies no space and no time. For one thing, that’s not quite true. The singularity, if it existed, occupied all space. It’s a condition of infinite density, not necessarily of infinitesimal radius. If space beyond the observable universe is infinite in extent, then it was so even at the Big Bang. This essay repeats vol. 1 without at all engaging with the many concerns and objections reflected in the (so far) 56 comments on vol. 1. Is it too much to ask for the author of a post to participate in, or at least comment on, other’s views of the work? Without that exchange, commenting seems like a more empty exercise. “Aquinas argued that the soul must exist because no bodily organ can be responsible for thinking . But when we measured for the existence of the soul we did not find it; the body did not get lighter after death. It was declared that the substance of which the soul is made must have no mass. This is deceptive as it implies that the soul was declared to have no mass as a response to the finding that the body did not get lighter after death. This is, of course, not the case. Neither Aquinas nor any theologian would have held the soul to have mass in the first place. Neither would they have expected the body to get lighter after death. It would be better to represent the theological view accurately instead of trying to shoehorn it into a meaningless analogy with phlogiston. I liked the article. Had never heard of Baba, but what a good example he is of the way people come to believe things that they want to believe. I am a little dubious about the way you use the word “scientific” with an almost religious awe. 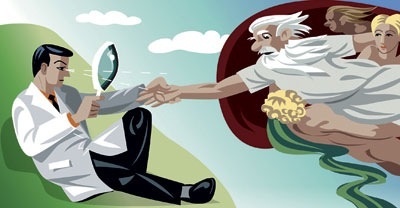 I’d be very interested in reading your comments on the moral-ethical dimensions of science in a world where technology- often erroneously muddled up with science- has brought us so much “good” and “evil”. I believe that Christians rarely justify their belief as an explanation of the world. They justify their belief in God on personal authority from direct experience of Him. In their eyes, the scientific worldview does not explain their experiences, therefore it does not answer more questions. Further, the assumption that the universe “out there” must be intelligible in terms of natural laws is merely an assumption. For those who are interested, I believe it is usual for them to hold it is an assumption that cannot be falsified, And that it is the unbelieving scientists who are ignoring evidence and exercising their faith. The thing is, given the views of science expressed in the first part, I’m not sure they aren’t being logical. I think philosophers agree there is no objective knowledge of realtiy, so I really can’t see why Christians should deny their psychological experiences as incompatible with the truth of reality. I’m not even sure that philosophers agree that denying the objective existence of reality is a bad thing. None of that contradicts what Aquinas said in any way. I don’t think he said “separable”, but I will have to check. But Aquinas clearly says that the intellect cannot function without the body, so how does this contradict him. In general this goes with a general misunderstanding of Christian ideas about the soul. Christians do not believe that the soul simply survives death. They believe that we die when we die, ie complete oblivion. But they also believe that we are resurrected later in new bodies. Of course this is not just a misunderstanding by non-Christians, many Christians also buy into the “go into the light” type of ideas and of communicating with “the other side”, which is not consistent with mainstream Christian doctrines. PS, we should not assume that Aquinas did not know what a brain is or what it does, even though Galens pioneering work on brain functions probably had still not made its way back to Europe from the Islamic scholars who preserved them. But I do expect it, and receive it, from the best blogs: e.g., Crooked Timber. That’s why we start the dialogue. First thank you for you response to my comments on Part 1 of this series. I agree that if we are explicitly including reason and logic as well as the empirical findings of science under the umbrella of science, than we are more well equipped to handle it. However, I’ve noticed that often times when I’m having discussions with theist, they don’t always have this broader understanding of science so I tend to use Scientia to indicate the broader meaning. Anyways, with the above cleared up, I really liked part 2. I especially liked the contrast between Sai Baba and Jesus as it really shows the irrationality of taking evidence for one person as true and not true for another. If you look back at the comments on part I, you will see that I did reply to many of the comments and criticisms. You will also see that I suggest that answers to many of the objections are coming in part III. Part II was written independently, before part I was even posted–that is why I did not respond to those comments here. The fact that we have not answered the hard problem of consciousness–we do not know how the brain produces consciousness–doesn’t entail that we don’t know that consciousness cant’ exist without the brain. Besides, “soul of the gaps” arguments are equally unscientific, as they commit the “mystery therefore magic” fallacy. And my main point about the singularity and God it simply this–the singularity requires less of an explanation than God and interjecting God as an explainable for it does not increase our understanding at all. I think ancillary debates about infinite space and such are beside the point. I’m not just talking about theologians, but the reasoning of the religious across the board. And there certainly has been attempts to measure the soul leaving the body. I’m sorry if I gave the impression that I was shoehorning, but the analogy still stands–it certainly is not meaningless: Believers in phlogiston made excuses so save their theory from the contrary evidence by saying that “the substance moves the molecules.” Believers in the soul made excuses so save their theory from the contrary evidence by saying “the substance moves the neurons.” Both are simply an ad-hoc excuse, and thus both are equally unscientific. I am not using the word scientific with a religious awe at all. I have simply defined was science is, what religion is, given examples of things that are unscientific, and then showed that they are analogous to important and common religious beliefs. X is unscientific; Y is like X in the relevant respects, so Y is unscientific too. Even if science was complete crap, the conclusion that such things are unscientific, would still hold. The further question is, do you care about being unscientific or being religious. If you don’t, my conclusion won’t bother you. But if you care about both, I show that you have some decisions to make. (a) I will deal with using religious experience to justify religious belief in Part III. It is equally unscientific. (b) This claim you make is false: “the assumption that the universe “out there” must be intelligible in terms of natural laws is merely an assumption.” This is like the creationists saying evolution is “Just a theory.” The hypothesis that the universe is, everywhere, governed by the same set of laws is well established–it is the most adequate (simplest, etc.) hypothesis consistent with our observations. Is it 100% proven? Of course not because nothing is in science–but it is as established as anything can be. To think that the fact that it hasn’t been proven 100% is a reason to doubt it is to commit the fallacy of appealing to ignorance (and to be unscientific.) You seem to simply be suggesting that “scientists take things on faith just as much as the religious” which is patently false, and has been debunked many times over. I agree that “soul” is not a biblical concept, and the resurrection (not souls) is what is endorsed by the creeds–but the idea that it’s this view of the afterlife, and not the “soul floats away to heaven” view, that is “mainstream” is patently false. It is endorsed, officially and in practice, constantly throughout Christianity. It’s not many Christians that buy into the soul view–but most Christians. Ever since Augustine got the idea from Plato and incorporated it into his Christian theology, it has been the dominate view. Most Christians think that people’s souls watch their funeral from heaven and that they are, immediately after death, “in a better place.” I’ve never been to a funeral where this idea was not endorsed. I am not misunderstanding Christian ideas about the soul–I know exactly what they are, where they come from, and how common they are. I believe you are mistakenly concluding that “mainstream” Christianity knows what you know and thinks what you think. And this doesn’t subtract from my main point anyway–because belief in the resurrection is also unscientific. Thanks! And yes, science is often pigeonholed into something like “what you can study in a lab.” This I think is part of what drives the idea that science and religion are computable. “You can’t study the resurrection or the soul in the lab–so my belief in them is not unscientific.” This is why you have to define what science (and religion) is before you talk about why they are compatible. I’m not really intending to start a side-debate, I just think there are a few things I would have said differently. I think you’re over-selling how well we understand the brain and I don’t think it’s fair to claim we know what you say we know. I agree that the “soul of the gaps” arguments are unscientific. I agree that the singularity requires less of an explanation than God, I just disagree with your stated reasons for why this is. I think a theist might think you’re special pleading and might make arguments that God requires less of an explanation than a singularity, e.g. because God is a transcendent being outside of time and space or some such nonsense. I think if you want to make the point that a singularity is simpler you need a better argument for it. (c) Thank you for your reply. (a) I’m sorry to anticipate. certain propositions, such as the geocentric theory . I even think that science has proven there is no magic. In other words, I think the appeal to ignorance as justification for certain beliefs is refuted by knowledge. Your vision of science seems to insist on an epistemological ignorance. I do not understand why ignorance is not grounds for doubt. It seems like the perfect justification for agnosticism to me. I know philosophy is bedeviled with terminological difficulties. But I really cannot understand why one must insist that science can’t prove there is no magic, but it can establish as well as anything can be there is no magic. What we seem to be contrasting is science and belief in a at least one god who is an agent – not deism or cultural religion. As far as I know some guy in the early 20th century tried to weigh the soul but it had nothing whatsoever to do with any known concept of the soul and theologians at the time would have simply rolled their eyes at the idea. And I have never heard of anyone saying “the substance moves the neurons”. Are you possibly talking about transmission theory? If so then I would suggest that it is not a widespread belief. As for “across the board”, I have come across a lot of bad reasoning from atheists throughout the years. Does that mean that I can assume such bad reasoning is indicative of how atheists think and conclude that atheism is incompatible with science? I am not sure if I could know what most Christians think without some sort of a survey. Most Christians I know subscribe to the Christian doctrine on this in that they will die and be resurrected. Why, by the way, is resurrection unscientific? Why do you think that your conscious experience could not, even in principle, be recreated after the death of your brain? Kyle Johnson wrote: “Since the natural theory is simpler, testable, and answers more questions than it raises, it is the scientifically preferable theory. If so then please go ahead and state the “natural theory” and show how it might be testable. As far as I know there are two inconsistent “natural” theories. First there is the theory of physical objects and then there is the “mathematical universe” theory. I know of no way in which either of those can be tested. I don’t know what questions they answer. Science needs neither the hypothesis of physical objects or of the mathematical universe, it goes fine with an agnostic view of reality. So what is the “natural” theory and why is it scientifically preferable – keeping in the mind that one is not obliged to subscribe to any metaphysical theory at all? To clarify, when I say that the two natural theories are “inconsistent”, I mean they they are inconsistent with each other, not that they are each, individually, inconsistent. So that would be an old-fashioned syllogism then? I don’t really understand what you mean by “soul of the gaps”. Suppose you have two sets of theories A type theories and B type theories. Now suppose a supporter of B type theories says “A type theories of X must be ruled out on the basis that a B type theory of X might turn out to be true”. This is obviously illogical because a supporter of A type theories might equally say “B type theories of X must be ruled out because a B type theory of X might turn out to be true”. There would be “A type theories of the gaps in B type theories” and “B type theories in the gaps of A type theories”. That does not make sense to me. If a supporter of A type theories wants to rule out B type theories then he must give reasons directly and not on the basis that B type theories might turn out to be true. Why is “outside of space and time” nonsense? I thought that you were a Mathematical Platonist? If so then surely “space and time” are simply elements of a particular mathematical model in your own metaphysical system and there must necessarily be things to which space and time do not apply. Why then do you so easily rule out that “outside of space and time” can be a meaningful concept in another metaphysical system. …but is it a scientific syllogism as defined by Popper. I am just being provocative here. I think you are quite right in what you say and I AM bothered by the many varieties of religious thinking- from Bible-bashers to Imams through believers in fairies. love-potions and ley lines. So presumably you reject Computationalism? If so, on what basis do you reject it? If not then you have accepted the proposition that consciousness can exist without the brain. I have got to say that I have never heard or read a Theist arguing thus. I have heard and read lots of Theists arguing the opposite (ie teleogy). Certainly Aquinas never argued thus, rather he argued teleology. I doubt he would ever have entertained such an argument. I really hope you address the issue of social coordination (theories of language), otherwise you might find your precious rationalism on the same footing as your religious adversaries; namely unscientific. I mean postulating a supernatural soul which is supposed to explain all the things we do not yet understand completely from a naturalistic standpoint, rather than assuming that there are naturalistic explanations yet to be discovered. I don’t really understand where you’re coming from with A type theories and B type theories. An example might help. If you think I’m saying that supernatural explanations are ruled out simply because there might be a natural explanation, that is not my position. Rather I’m saying that there is no good motivation to believe in a supernatural explanation simply because we don’t have a natural explanation yet. It isn’t. But to think that saying something like “God is a transcendent being existing outside of space and time” is enough to account for why God demands no explanation is to me nonsense. Optional reading for discussion in philosophy class. Thanks. The following doesn’t really effect the point your are making, but is to correct a factual mistake. I believe you are mistaking phlogiston for caloric. Caloric was the substance proposed to flow in and out of objects making them hot or cold. Phlogiston was proposed as a substance in combustible materials. Phlogiston theory was later replaced by the oxygen theory of combustion.